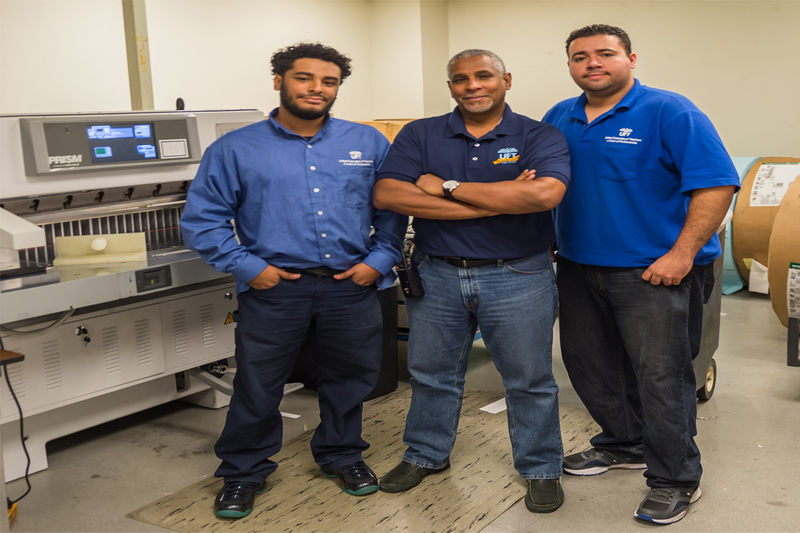 Oscar Rivera (center) with operators Gabriel Rivera (left) and Steve Rodriguez next to their Colter & Peterson Prism paper cutter. Days at the in-plant operation that Oscar Rivera manages for the United Federation of Teachers (UFT) rival the bustling atmosphere of the shop’s environs in lower Manhattan. The Printing and Mail Department has transformed itself in the last decade, adding an array of equipment to handle an ever-increasing amount of work. The finishing department has benefitted as well, having installed a 32″ Prism paper cutter from Colter & Peterson earlier this year to help speed up the process of getting work out the door to over 200,000 members. Rivera is quick to credit Rick Fassano, his local Colter & Peterson dealer at Summit Offset Service, for recommending the Prism paper cutter. Fassano had placed a 27″ Prism PC paper cutter last year at the New York Stock Exchange, a short walk from UFT’s offices. The 32″ Prism joins an impressive list of equipment at the UFT in-plant. In addition to web and sheetfed presses, the digital side includes various Konica Minolta bizhub presses for black and white and color work. Rivera and his team count on Epson Stylus, HP DesignJet and KIP wide format machines to handle the signage and large graphics work. With all of that firepower, the Prism gets a workout. “The Challenge cutter wasn’t programmable and there was a lot of stopping and starting,” says Rivera, who manages a staff of 16. “The Prism is programmable and a better, more efficient product. We set the cut, cut it, and then go on to the next one. The table bed has air running under it to lift the paper, so it makes us much faster than before. As in any operation, Rivera’s team at times will experience busier than average periods. “No two days are alike. Sometimes it looks like ants at a rainy picnic in here,” Rivera says. “Summer is our downtime, where we catch up on fill-in work. Once the school year begins in mid-August, the Prism cuts 40 to 50 jobs a day. We stay very busy until Thanksgiving, then do a lot of holiday related work until the end of the year. Most managers want what’s best for the team. For Rivera, there were other selling points to the Prism that have met all of his expectations. “This cutter has made life easier for them. That’s great because they work very hard and stay busy with many other things, so we don’t usually have to worry about the Prism,” Rivera says. “It is a very quiet machine, and you rarely hear it. In-Plant Graphics magazine published a detailed profile of the UFT in-plant last year. Read it here. This entry was posted in general news, installations by Patrick Henry. Bookmark the permalink.